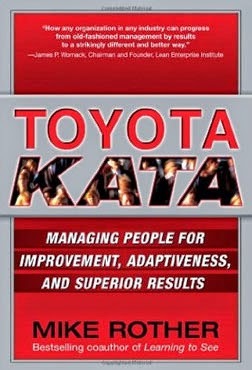 My friend and colleague Mike Rother wrote a fine book a few years back called Toyota Kata. In it he described the problem solving process I was lucky enough to learn at Toyota manufacturing. Mike astutely called it the “improvement kata”, invoking the martial arts concept of a core routine that you practice over and over. How does the improvement kata relate to Strategy Deployment (aka Hoshin Kanri)? Strategy Deployment is a planning and execution system whose process entails continually surfacing problems – so we can fix them. Step 4 entails harvesting all the now visible problems. How do we do that? There’s no one best way – you pick the tool that’s most helpful. Each of these tools, in fact, is informed by the same powerful algorithm our Toyota senseis taught us all those years ago. But that’s not true in many organizations. We find people benefit from practicing core problem solving routines, the same way I benefit when I practice core Aikido movements.